My Weekly Indicator column for this week is up at XE.com. Here we are in the dog days of summer, and the numbers are like a lazily and happily snoozing pooch. Every month there seems to be a debate about the strength, or lack thereof, of the recovery in jobs since the depths of the Great Recession. Professor Paul Krugman's back of the envelope measure has been the employment to population ratio in the 25 to 54 age group. This takes care of the confounding issue of Boomer retirements, but on the other hand, it doesn't take into account changes in, for example, the trade off between work and child care costs in terms of employment decisions. With that in mind, I've been working on a better, more detailed metric for labor utilization. Even this measure isn't perfect, since we don't know how the average number of hours desired, or worked, by those who only want part time work, has changed over time. But as you can see, there is very little difference between the two graphs. Both graphs show that, as compared with the tech boom in the late 1990s, even at its peak, the last economic expansion had a shortfall of 4% of hours available to work, and our current expansion is about 2% below that, or 6% less than the peak of a bona fide economic boom. On the other hand, its current measure is equivalent to early 1996 or 2006, which weren't exactly awful. In summary, not awful, but not a boom either. We probably need to add at least 2% to the total hours available, i.e., exceed the 2007 peak, before we have a reasonably comfortable employment situation. The net result is that we are probably about 2% shy of the aggregate hours that would be consistent with strong labor utilization. As many of you probably recall, I frequently check the webcams at Kilauea volcano in Hawaii. Usually the summit and the outlet cone quietly steam away, and the lava politely flows downhill towards the Pacific Ocean, but a few times a year, something of more interest like the opening of a new vent happens. As to which, enter Hurricane Iselle. Not only is this the first full fledged hurricane forecast to hit the Big Island since about forever, its currently forecast track takes it directly over Kilauea. Since Kilauea isn't having an explosive eruption, we won't see how a full fledged ash cloud interacts with hurricane wall clouds. But, assuming the webcams stay in operation, we may see plenty of steam from the interaction with the lava flows and underground hot spots. The bigger Deathmatch will probably be won by Mauna Kea and Mauna Loa, the two 15,000 foot high volcanoes that dominate the island. I imagine they will rip apart much of the upper architecture of the hurricane. Anyway, tomorrow should be an interesting day to watch! I have a new post up at XE.com taking a detailed look at the apartment boom, which is the only part of the housing market that has been growing in the last year. This is a slow week for data. That being said, there is some worthwhile updated information on labor utilization, the housing market, and wages. There's actually a lot on wages, but I want to wait for Friday, when 2Q unit labor costs are reported, before writing up that grand tour. Today, let's update the "real real unemployment rate" for July. This is my corrective for those commentators who have put together metrics that either assume there is no retiring Baby Boom, or rely upon nearly decade-old estimates. There's simply no need for doing so, when every month the Census Bureau publishes the seasonally adjusted number of people who have completely stopped looking for work, but would nevertheless like a job now. Aside from the thoroughly preventable human tragedy, this has negative multiplier effect on consumer spending, and so is a self-inflicted drag on the economy. The U6 calculation of underemployed vs. the "real underemployment rate" follows the same trajectory. 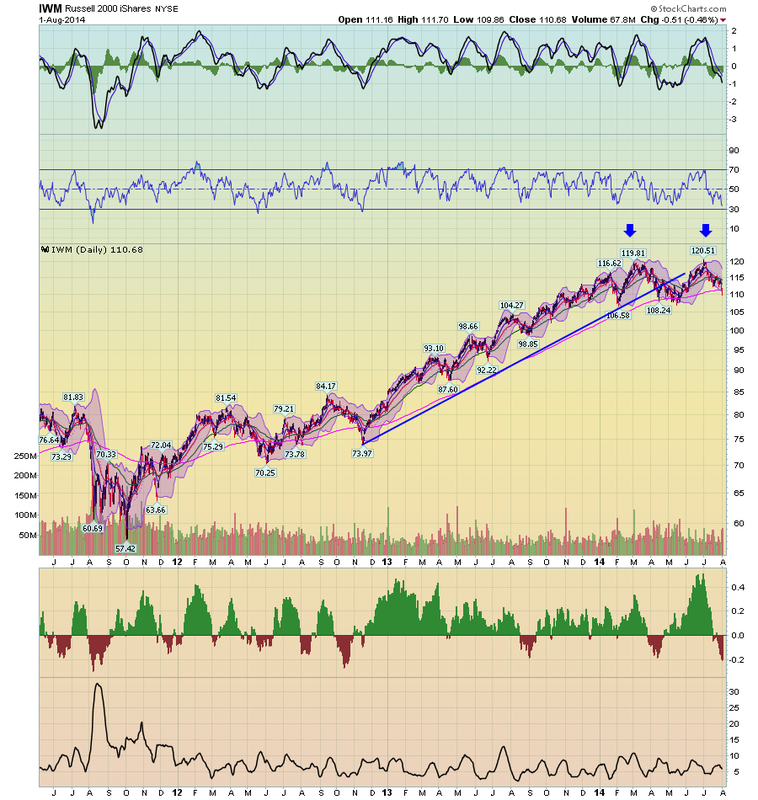 Has the Russell 2000 ETF Formed a Double Top?